Oysters have been farmed since Roman times, and in many areas things are done much the same as they were back then--because they still work. However, there has been quite a leap in farming methods which has allowed oysters to be farmed in many areas much more efficiently or in areas where it wouldn’t have been possible before. There are four main types of oyster farming in North America. Click on any of these highlighted titles to view more detailed information. Oysters are grown on the grounds of intertidal regions, feeding on the plankton available in the incoming tide. These areas are usually gravel or hard packed sand beaches. Oysters are cultivated in plastic net bags supported above the ground on steel racks so that water can flow completely around the oysters allowing them to feed faster and be protected from crabs and other predators. This method also makes it possible to grow oysters in areas which might otherwise be too muddy to grow them directly on the intertidal grounds. This method may vary between suspended tray culture or lantern net culture. The purpose of this method is to allow for growing oysters in deeper, sub tidal waters. The oysters are placed in trays or nets which are suspended from floats or sub-tidal longlines so they can hang below the surface of the water 24 hours per day allowing for the oysters to grow very fast. This is another suspension method where adult oyster shells with baby oysters set on them and are then inserted into the strands of a rope. The shells are spaced out every foot or two along a 300-600 foot rope. The rope is then stretched along the ground in the intertidal region at low tide and supported about a foot above the ground with pegs. The end result is that the entire length of rope and shell is suspended above the natural bed allowing for the oysters to grow faster than if they’d settled down into the mud or sand. New systems have been developed for Inter-tidal longline culture that have been proven sustainable. These new systems using SEPA bags and Flip bags allow eel grass to develop and sustain sea life such as crabs and other organisms. SEPA and Flip bags are the future of intertidal longline farming due to their sustainable nature the ability for sea life to develop amongst it. 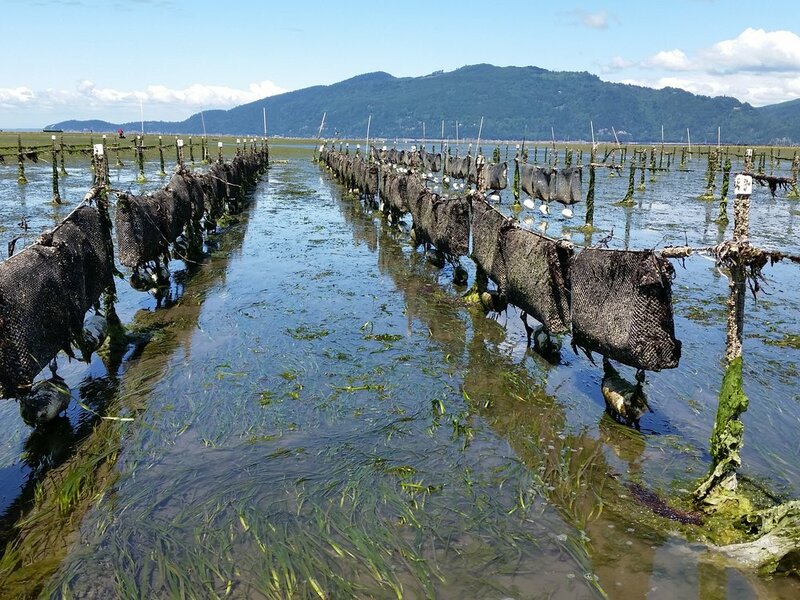 For more information on farming oysters, click the following link to visit the Washington Sea Grant site which covers the history of oyster farming in Washington State over the last 100 years.